Foundation - 17 Miracle Matte in Fair. 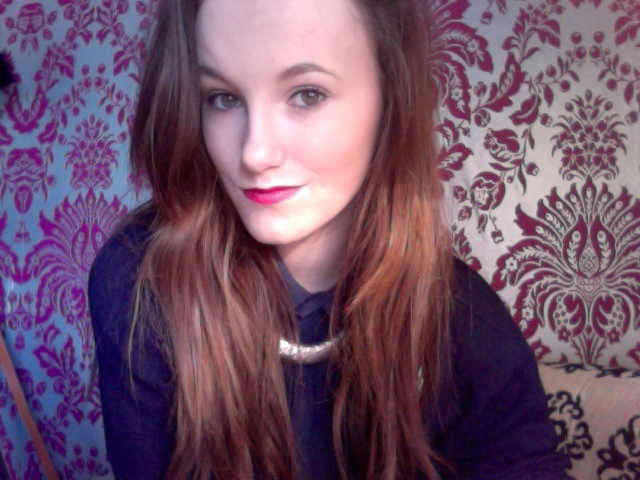 Lipstick - Urban Decay Jilted. Eyeshadow - Naked Palette. Bronzer - Benefit Hoola. Eyeliner - Topshop. Blush - Natural Collection Pink Cloud. Mascara - S&G Thick & Fast. Shirt - New Look. Necklace - Primark. Happy belated St. Patricks day. Didn't do anything for it other than going out last night. Our towns parade is usually a bunch of lorries driving around with advertisements for local businesses. It's lame. I'd of rather stayed home last night wrapped up in bed watching 'Charmed' whilst drinking tea and eating my way through an entire pack of custard creams.....which is so not what happened 20mins before going out.....*cough**cough*. I hope you all had a lovely day anyway. (: It's mothers day today, so after being woken by my little brother at the crack of dawn (okay 10 am) it was off downstairs to grab our presents and bring mum some breakfast in bed. Trying to convince her to let me get a new wardrobe from Ikea. Its not going so well. Tomorrows a bank holiday here so we'll be off to the carboot sale tomorrow morning for a bit of rummaging. Hope you're all well.. Regarding the song- I'm affraid it's kinda hard to explain in the comment box, but I'll do my best. You can change the width and colour as you wish. The most important thing is to have a look at the URL of the youtube video you want to use as an audio stream and insert the end of it instead of the "Jbp52z9jRg0" (in this exaple here). Your make up is gorgeous! You look naturally and i really like this! Beautiful lipstick!